Fundraising: Please stay tuned to our Facebook page and the BCQHA website for various fundraising as that is how we are able to offer our awesome events and programs. There will be pub nights, paint nights, raffles and more. 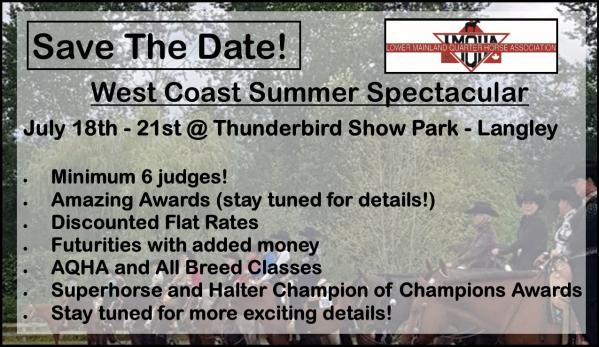 This year's event is April 7th at the beautiful Thunderbird Show Park in Langley! We have 14 time World Champion Cynthia Cantleberry giving 2 clinics along with a variety of other horse clinics and demos sure to please! We have an entertainer who does rock and roll, country and even Elvis! We also have a used tack sale, farm animals, dog demos and of course our trade fair! Lots to do and see at the Bazaar. We are always looking for volunteers, please contact us if you could pitch in. Many thanks to Bazaar Sponsors: Stampede Tack, Preston's GM, JR FM, Spanmaster, Saddle Up, Thunderbird Show Park, Petersen Trailers and Bernhaussen Diesel! Our BIG show which is back to 4 days and an unprecedented 6 judges! Once again we will have amazing prizes and of course the LMQHA Breeders Incentive Futurity. 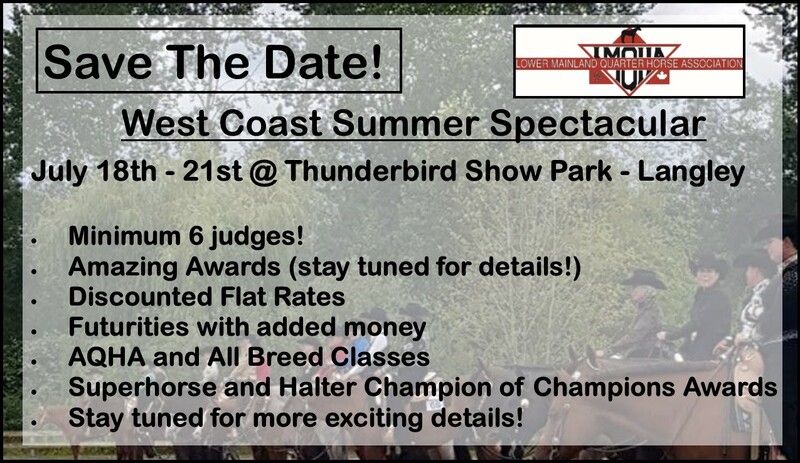 Mark your calendars and plan to attend this premier event at Thunderbird Show Park. Thank you to all the amazing sponsors who make all of this possible.